Which Life Jacket Will Actually Save My Life? - R.S. Semler & Associates Insurance, Inc. When do I need to have a Personal Flotation Device (PFD)? 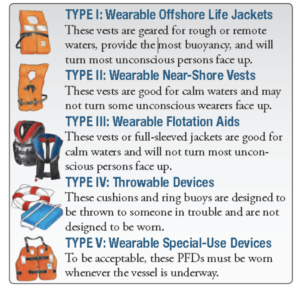 All vessels (including canoes, kayaks, and paddleboards) must have at least one USCG approved wearable personal flotation device or PFD (life jacket) for each person on board. All vessels 16 feet or more in length (except canoes, kayaks and paddleboards) must have one USCG approved throwable PFD on board that is immediately accessible. Federal law requires children under the age of 13 to wear a USCG approved PFD while underway in an open vessel on federally controlled waters. Sailboards and windsurfers are exempt from PFD requirements but are encouraged to wear a PFD. Every person on board a personal watercraft must wear a USCG approved Type I, II, III, or V PFD. In good and serviceable condition, which means no tears, rips, broken straps or snaps. Readily accessible which means you are able to put the PFD on quickly in an emergency. Of the proper size for the intended wearer: Sizing for PFD’s is based on body weight and chest size. Which PFD is right for me and my family? R.S. Semler & Associates Insurance, Inc. have been providing peace-of-mind to Hartford and its surrounding counties for over 50 years. We represent only the most reputable and financially stable insurance companies, which gives our clients the protection they deserve. Our specialty is tailoring policies specific to your personal or commercial needs. The professional independent agents at R.S. Semler & Associates Insurance Inc. are local community members who see you as a neighbor not just a policy number. We help friends and neighbors manage their risk by providing personal support and service by getting to know you and your situation so we can better answer your questions and suggest the best coverages for you.